An epic level of wrongness. 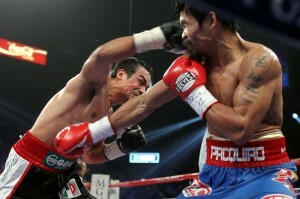 For weeks on end, I boastfully stated what an utter mismatch Manny Pacquiao was for Juan Manuel Marquez. My last column leading up to Saturday’s bout was essentially a mockery of the fight. Juan Manuel Marquez, you made me look foolish. And I’m so happy you did! One thing that I haven’t been wrong about, is Floyd Mayweather’s standing as the number one fighter in the world pound for pound. Although Manny Pacquiao is an all time great, he is not on the same level of Floyd Mayweather. Last night’s contest proved even further this fact. Don’t give me the cliched “styles make fights” argument either. No matter the style, no matter the fight…Floyd Mayweather makes them all look bad. Floyd Mayweather shut Juan Manuel Marquez out after 18 months of inactivity. Marquez didn’t win a second of that fight. Manny Pacquiao got a gift decision against an even older Marquez. This decision was so bad, and Manny’s performance was so woeful, I’m tempted to put Sergio Martinez ahead of Manny in my pound for pound rankings! Honestly, I would rather see Pacquiao/Marquez IV and Mayweather/Martinez at this point. I’m sure most fans agree. During Manny Pacquiao’s post fight interview with HBO’s Max Kellerman, an unfamiliar chorus of boos reigned down on the Filipino icon. “My fans are very happy because they thought I won,” Pacquiao said. For some reason, I doubt that. On Oscar De La Hoya’s Twitter account, even the Golden Boy gave props to Floyd Mayweather—and keep in mind there is no love lost between Oscar and Floyd. “I think this shows how superior Mayweather is,” tweeted De La Hoya. Bob Arum does not want to make Floyd Mayweather vs. Manny Pacquiao. “My advice to all parties involved is an immediate rematch.” said Arum. Last night’s fight was supposed to be a finality. An exclamation point for Manny Pacquiao. It was supposed to end any and all doubt that the first two epic wars between Pacquiao and Marquez may have had. It was supposed to be a night where Manny settled the only unfinished business in his career. It was supposed to be the final act before a fight with the great Floyd Mayweather. Instead, it only showed how human Manny Pacquiao truly is. I honestly thought Manny would destroy Juan Manuel Marquez. I thought it would be the perfect lead in to negotiations with Floyd Mayweather. I thought we may finally see the super-fight that the world wants. Sometimes it feels good to be wrong.